The goal of this quickstart guide is to provide you with a first hands-on look at Kafka Streams. We will demonstrate how to run your first Java application that uses the Kafka Streams library by showcasing a simple end-to-end data pipeline powered by Kafka. It is worth noting that this quickstart will only scratch the surface of Kafka Streams. More details are provided in the remainder of the Kafka Streams documentation, and we will include pointers throughout the quickstart to give you directions. // `map` to ensure the words are available as message keys, too. In this section we install and start a Kafka cluster on a single machine. This cluster consists of a single-node Kafka cluster (= only one broker) alongside a single-node ZooKeeper ensemble. This single-machine setup is required because the WordCount demo application we are about to run assumes that the Kafka broker is running at localhost:9092 and the ZooKeeper process at localhost:2181. First you must install Oracle Java JRE or JDK >= 1.7 on the machine. See Installation via ZIP and TAR archives and Confluent Platform Quickstart for further information. We will now send some input data to a Kafka topic, which will subsequently processed by a Kafka Streams application. The Kafka console producer reads the data from STDIN line-by-line, and publishes each line as a separate Kafka message to the topic streams-file-input, where the message key is null and the message value is the respective line, encoded as a string. This Quickstart vs. Stream Data Reality(tm): You might wonder how this step-by-step quickstart compares to a “real” stream data platform, where data is always on the move, at large scale and in realtime. Keep in mind that the purpose of this quickstart is to demonstrate, in simple terms, the various facets of an end-to-end data pipeline powered by Kafka and Kafka Streams. For didactic reasons we intentionally split the quickstart into clearly separated, sequential steps. We will run the WordCount demo application, which is included in Apache Kafka. It implements the WordCount algorithm, which computes a word occurrence histogram from an input text. However, unlike other WordCount examples you might have seen before that operate on bounded data, the WordCount demo application behaves slightly differently because it is designed to operate on an infinite, unbounded stream of data. Similar to the bounded variant, it is a stateful algorithm that tracks and updates the counts of words. However, since it must assume potentially unbounded input data, it will periodically output its current state and results while continuing to process more data because it cannot know when it has processed “all” the input data. This is a typical difference between the class of algorithms that operate on unbounded streams of data and, say, batch processing algorithms such as Hadoop MapReduce. It will be easier to understand this difference once we inspect the actual output data later on. Because the WordCount demo is bundled with Kafka, it is already preinstalled and available on the Kafka broker. This means we can run it without much further ado, i.e. we do not need to compile any Java sources and so on. # Run the WordCount demo application. There won't be any STDOUT output. # Why not this, you may ask? The explanation is that the output of the WordCount application is actually a continuous stream of updates, where each data record (i.e. each line in the original output above) is an updated count of a single word aka record key such as “kafka”. For multiple records with the same key, each later record is an update of the previous one. The two diagrams below illustrate what is essentially happening behind the scenes. The first column shows the evolution of the current state of the KTable<String, Long> that is counting word occurrences for countByKey. The second column shows the change records that result from state updates to the KTable and that eventually, once converted to a KStream<String, Long> via KTable#toStream(), are being sent to the output Kafka topic. First the text line “all streams lead to kafka” is being processed. 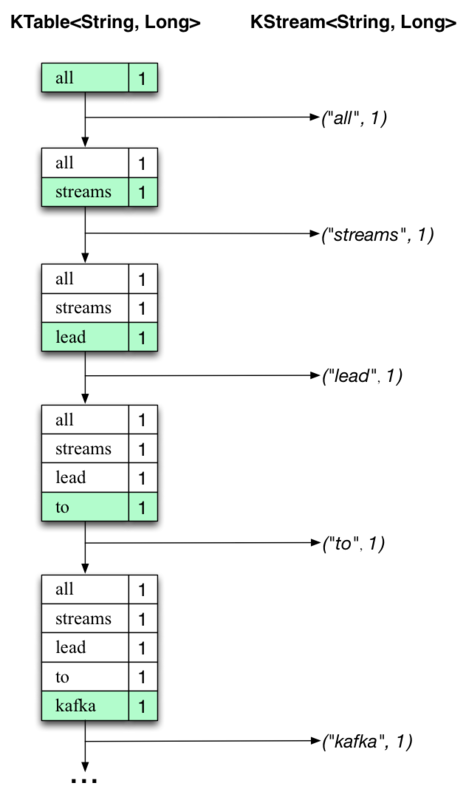 The KTable is being built up as each new word results in a new table entry (highlighted with a green background), and a corresponding change record is sent to the downstream KStream. 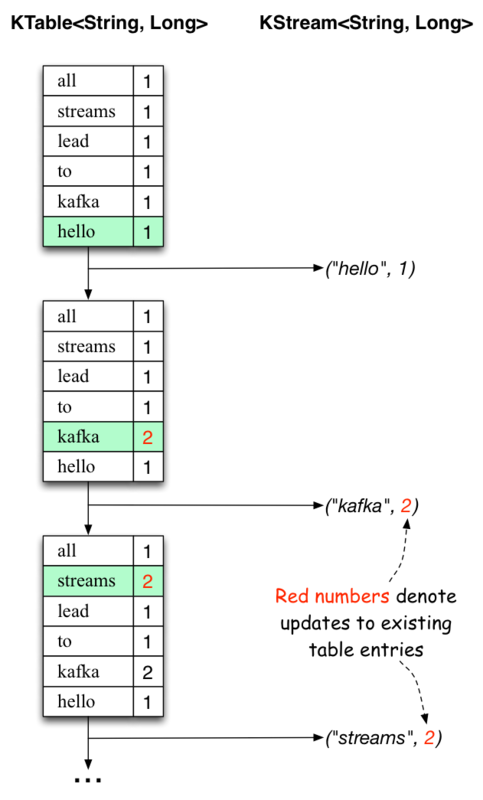 When the second text line “hello kafka streams” is processed, we observe, for the first time, that existing entries in the KTable are being updated (here: for the words “kafka” and for “streams”). And again, change records are being sent to the KStream.